Facebook uses an innovative concept called as Social ads through which it connects ads to people who have Liked that brand's Facebook page. These ads appear on the the right-hand side of the home page stating that "Sajith likes this." This often brings some choices that a person might have intended to keep personal to the forefront. I once saw an ad with my friend (who runs an online business) advocating a competing brand. He might have Liked that Page to be updated about that brand's activities but he surely wouldnt want to be seen advocating it. It's true that his friends could just navigate to his Facebook profile and see this Brand amongst his Interests but its not the same as an advertisment that pops up on a friend's home page with his name attached to it. According to Facebook "everyone wants to know what their friends like". So they pair ads and friends to make it easy for users to find products and services that "they are interested in, based on what their friends share and like." This social pairing has now gone one step further with Sponsored Stories that appear on a user's feeds. It now connects people to posts from Pages they have Liked... posts they might even not want to assoicate with. For eg. in this snapshot two of my connections are shown promoting embarrassing posts on Facebook without them endorsing it. They just happened to like a Page about." Bollywood, Fashion & Lifestyle...." and they didnt like or share this post. 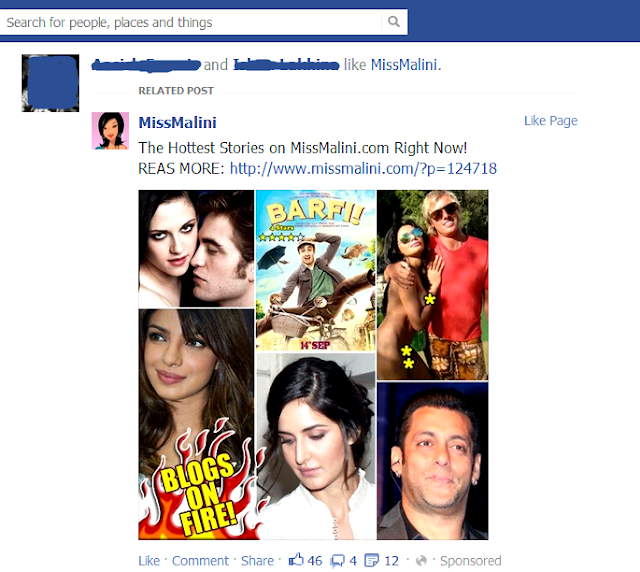 But just because they Liked that Page Facebook decided to pair them with the Page and this sponsored post. People are made advocates for Pages they like and its promoted posts without any permission. Facebook surely allows a user to turn OFF this setting. But the default setting is ON. Hope Facebook is more sensitive in the way its uses its User data than seeking its users to routinely go through the changing privacy guidelines and adjust it to avoid embarassments. Till then you may atleast turn OFF this Option which does no good to you but can put you in embarrassing feeds even while you dont know about it. Step 2: Click the down arrow to the right of your name in the top right-hand corner and select Account Settings. Step 3: On the left-hand side, choose Facebook Ads from the list. Step 4: Click the link at the bottom that says Edit social ads setting. Step 5: Select 'No One' from the drop-down list and press Save Changes. The following interaction by TechCrunch’s Josh Constine with Greg Badros, Facebook’s vice president of engineering and products at the Crunchup conference gets you to see the other side of the social ads. It shows how Facebook benefits from this social pairing strategy on Sponsored stories. It is a unique selling proposition for them that other online publishers will find difficult to emulate anytime soon. Q: How many Sponsored Stories are you showing in people’s newsfeeds now? Badros: Most of what’s in the newsfeeds is organic. We just incorporate a commercial signal into the newsfeed ranking. Q: What is the frequency of ads shown now? Badros: It really depends on the user. We really focus on trying to optimize the experience for the user. Q: What’s the max that users can stand? Badros: We don’t know. We’re going to wait and see how users behave. I’m not sure users even realize some of the content is advertising. We want to show stories that people want to see, and it can be advertisers. Q: If users click on more ads, will they get shown more ads? Q: Are you doing enough to make it clear what’s an ad? Badros: Some advertisers ask for it to be highlighted and others think that will make them blind to them. We absolutely believe in transparency. Q: What industries are being served well by Sponsored Stories and which are not as appropriate? Badros: Developers (I think he meant advertisers) that publish a great story people like, they’re getting engagement. Q: What verticals aren’t spending enough on Facebook? Badros: Every vertical could be spending more on Facebook? Why should somebody not be spending a lot of their budget on Facebook? We haven’t really cracked the code on retail–search works better for fulfillment there. There’s a lot of opportunity for big brands in lots of verticals. What do you feel about these ads? Are social ads an easy way to find your interests based on what your friends like? Or are they just one more way of broadcasting unnecessary information? Share with us through comments.